US-funded propagandist & agent of sedition Ales Bialiatski gets 4 years in prison in Belarus. November 26, 2011 - Freedom House, premier peddlers of the entirely disingenuous Western "human rights" crusade, has made a passionate plea for the release of Ales Bialiatski, a "prominent Belarusian human rights defender and head of the Human Rights Center “Viasna,”" who has been sentenced to over 4 years in a Belarus prison. What Freedom House doesn't tell you is that Bialiatski is actually the vice president of the US National Endowment for Democracy and George Soros Open Society-funded International Federation for Human Rights (FIDH) - making him anything but a "human rights defender" and instead a coordinator of US-backed destabilization efforts that have been ongoing in the Eastern European nation for years. Bialiatski's US-funded FIDH has also been recently exposed as behind the entire Tunisian uprising in January 2011. 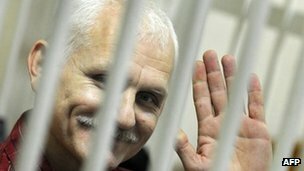 Photo: US-funded agent of sedition Ales Bialiatski now resides safely behind the bars of a Belarus prison. Bialiatski was vice president of the sedition-sowing FIDH, an umbrella organization that has fomented US-backed unrest from Tunisia to the borders of Russia and China. That Freedom House calls the arrest, trial, and imprisonment of one of their agents of sedition a "human rights abuse" illustrates just how credible their entire "human rights" agenda turns out to be, i.e. not credible at all. BBC, while also obfuscating Bialiatski's ties to the US government-funded FIDH, claims that his "organisation called Vyasna (Spring)" works to monitor "government's activities against opposition figures." In other words, all the US-backed opposition parties are given rhetorical support from Vyasna who portrays them as hapless victims at the hands of the "tyrannical" Belarus government - just as the US does in many other nations around the world in a bid to install their own autocratic regimes. BBC also notes that Soros' Open Society-funded Human Rights Watch has also predictably come to Bialiatski's aid. As reported as far back as April, 2011, Belarus has been overtly marked as "next" by Wall Street-London interests dissecting the planet, starting with their premeditated "Arab Spring" destabilization. After Tunisia fell and protests began brewing in Egypt, Foreign Policy magazine published Freedom House's list of "Who's Next?" On the list was Belarus' Aleksander Lukashenko. NATO has admitted the reluctance of Belarus to join its now unjustified yet ever expanding organization, and at the Globsec 2011 conference, Belarus was considered a threat to both the EU and NATO, having turned down NATO in favor of closer ties with Moscow. The corporate mainstream media for their part, has berated the Belarusian government for putting down protests launched after the results of recent elections that saw the Western-backed opposition defeated. In a March 2011 speech, Joe Lieberman called for the unconditional release of Belarusian "activists" as well as the tightening of sanctions against Belarusian president Aleksander Lukashenko. His speech outlines a clear intention to meddle in the sovereign affairs of Belarus and to fold the nation into an Atlantic NATO EU order. It is also a matter of record that Lieberman's Belarus protesters were the recipients of training from the US created and funded CANVAS of Serbia. In Foreign Policy's article "Revolution U, it states that "Slobodan Djinovic, one of Otpor's original organizers, began traveling to Belarus, meeting clandestinely with a student movement there. It was soon infiltrated, however, and eventually collapsed." In a March 2011 report, it was noted that with such a failure as described in Foreign Policy's article, "it is more than likely the US is looking for ways around this, and judging from the contempt Lieberman speaks of the Belarus regime with, it must have long since taken its gloves off and fully recognizes the threat the US State Department has left on its doorstep." With the Belarus government specifically targeting the ring leaders of US-funded sedition within their borders, it is clear that this analysis was correct and that Belarus knows exactly who its real enemies are and exactly how to deal with them. FIDH's Mr. Bialiatski isn't the first US agent of sedition to see the inside of an Eastern European jail cell, Russia's Mikhail Khodorkovsky has also been imprisoned for his role in US-funded sedition within the Russian Federation. Again, Wall Street and London reacted by claiming his imprisonment was a "miscarriage of justice" and a sign of Russia's "human rights abuses." A full account of Khodorkovsky's "defense" and his crimes can be found here. Belarus is setting an important precedent in dealing with foreign-funded sedition masquerading behind a disingenuous "human rights" agenda. As pointed out previously, the US National Endowment for Democracy, Freedom House, and their various pet projects are overseen by perhaps the most morally bankrupted men humanity has ever produced. They include warmongers, corporate-fascists, and unabashed promoters of Wall Street-London global hegemony (imperialism). It is an absolute certainty that these individuals and the organizations they collectively belong to are not interested in "human rights" beyond how they can leverage and pervert these noble ideals to deceive well-meaning people into helping them achieve their self-serving agendas.